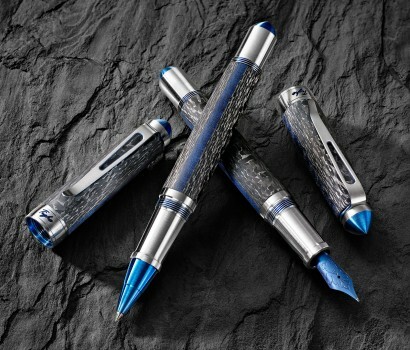 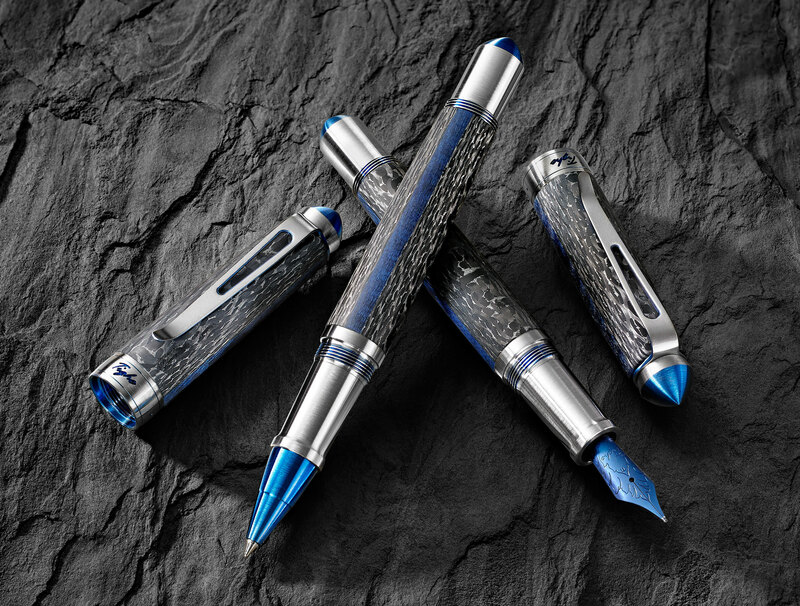 Handmade Hybrid Blue Metallic Glass Fiber and Stainless Steel infused Carbon Fiber composite over 2-toned Titanium. 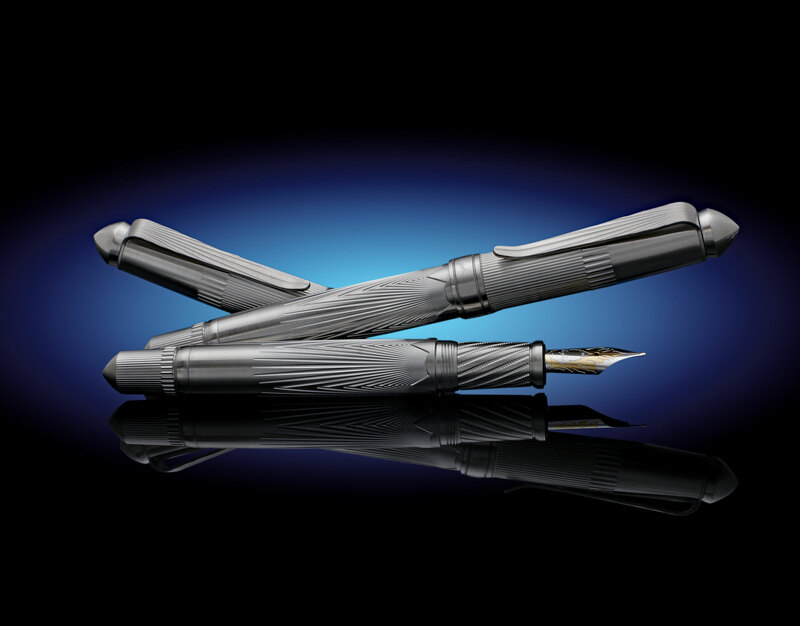 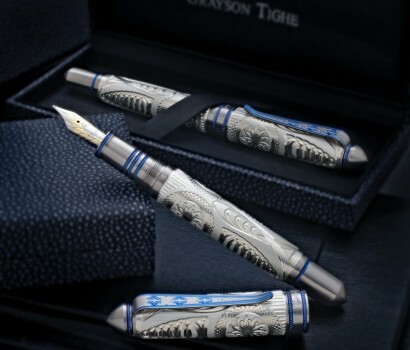 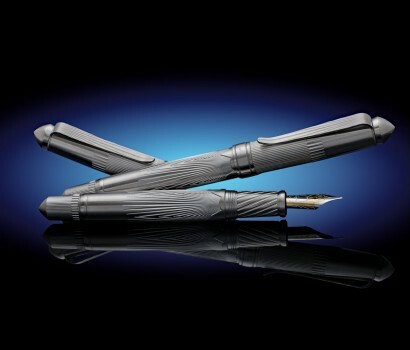 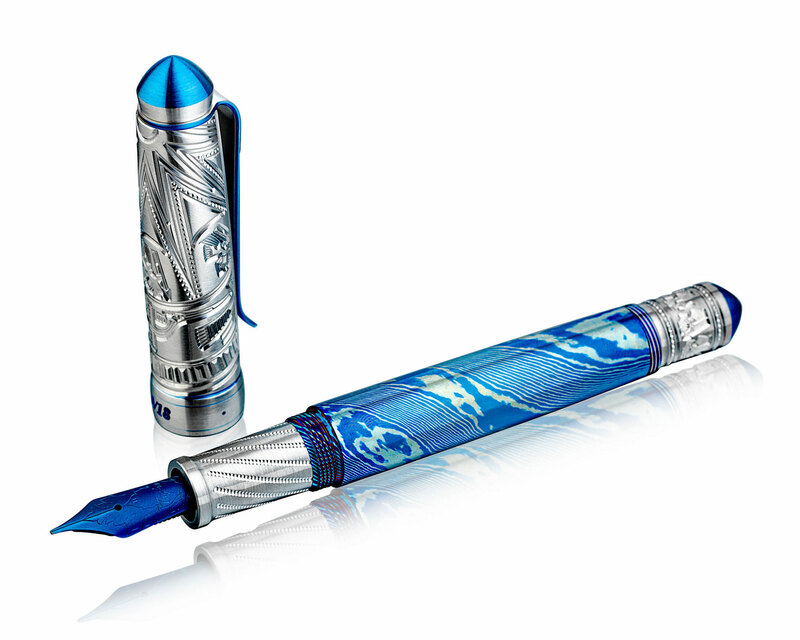 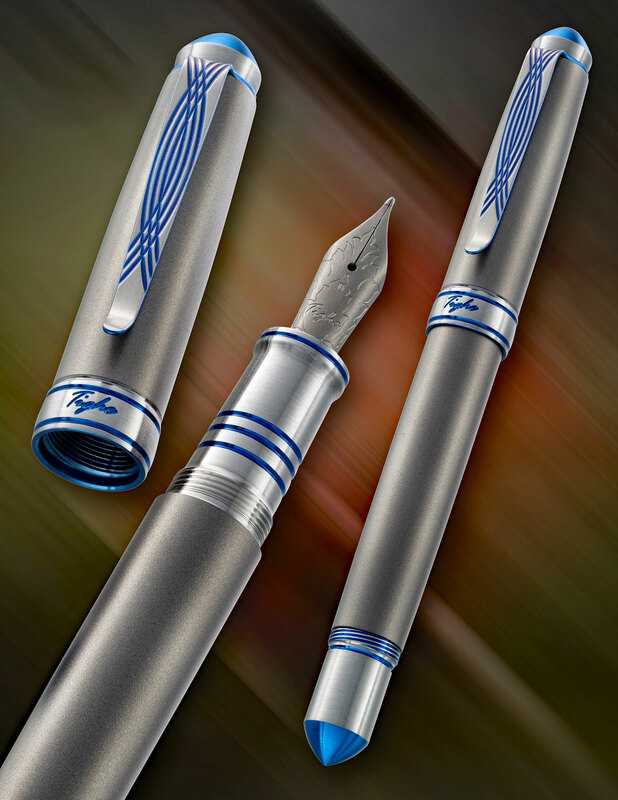 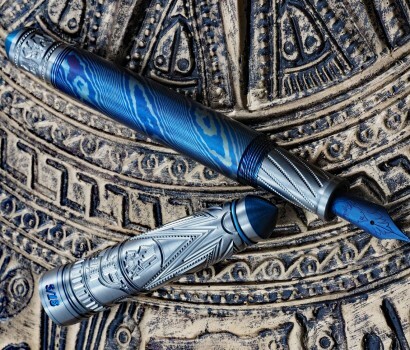 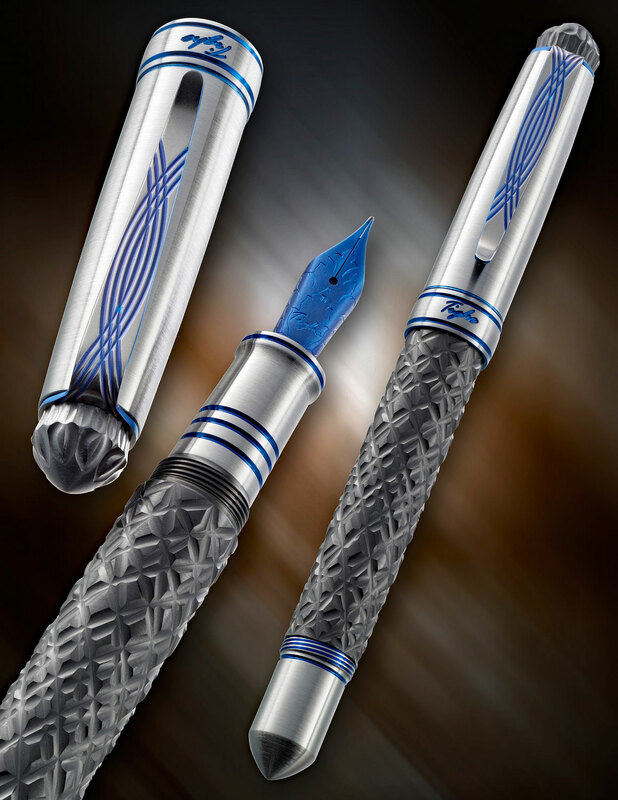 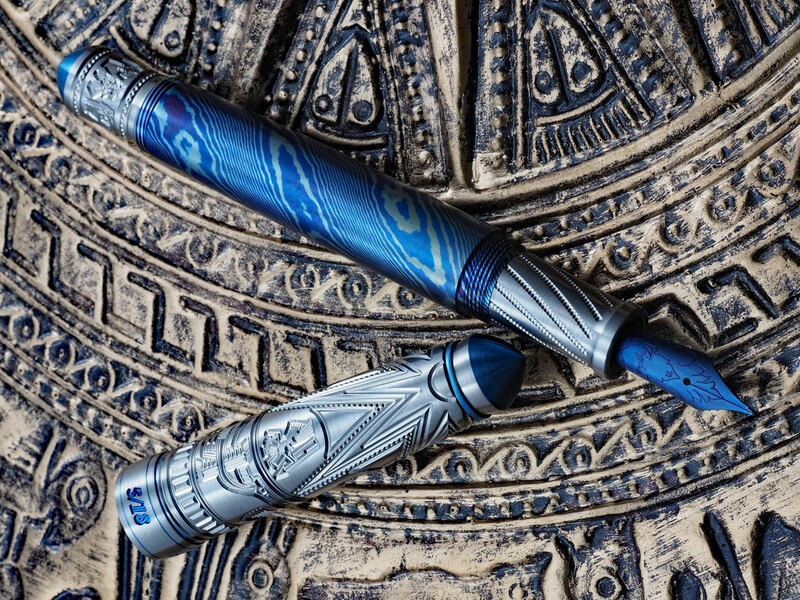 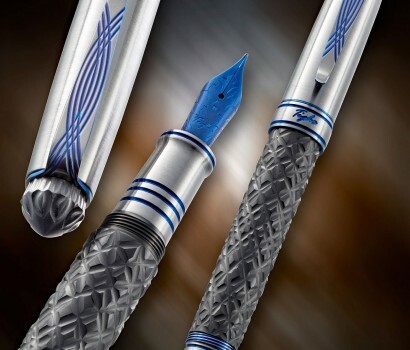 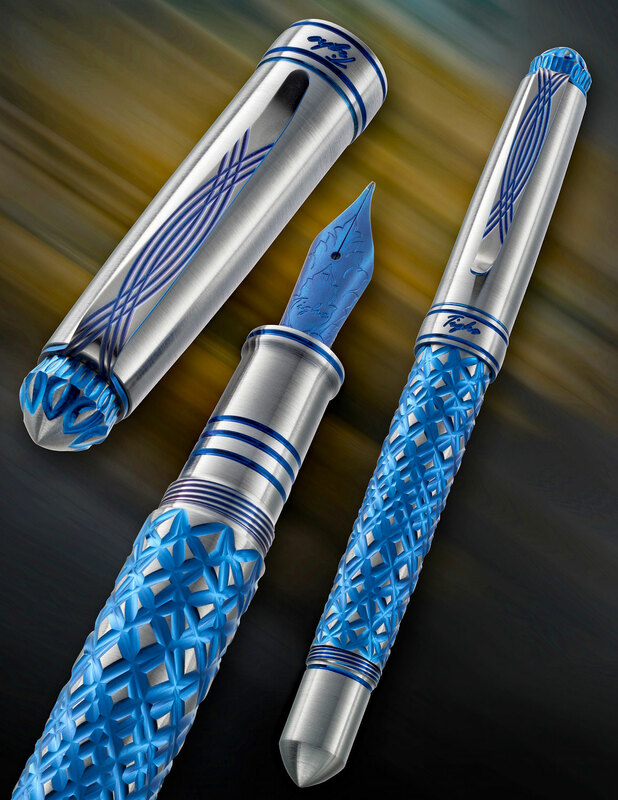 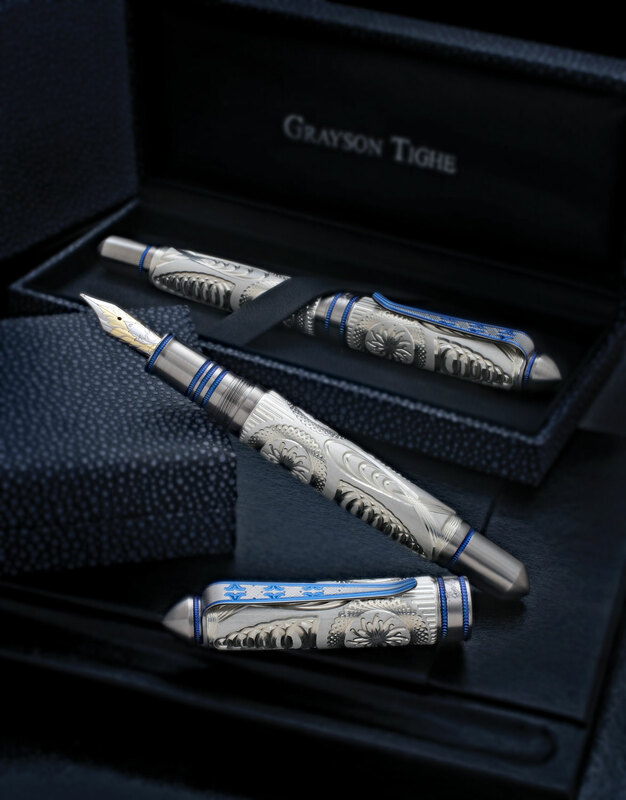 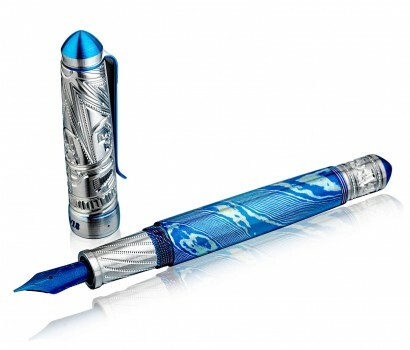 Fountain pen with Blued Titanium nib. 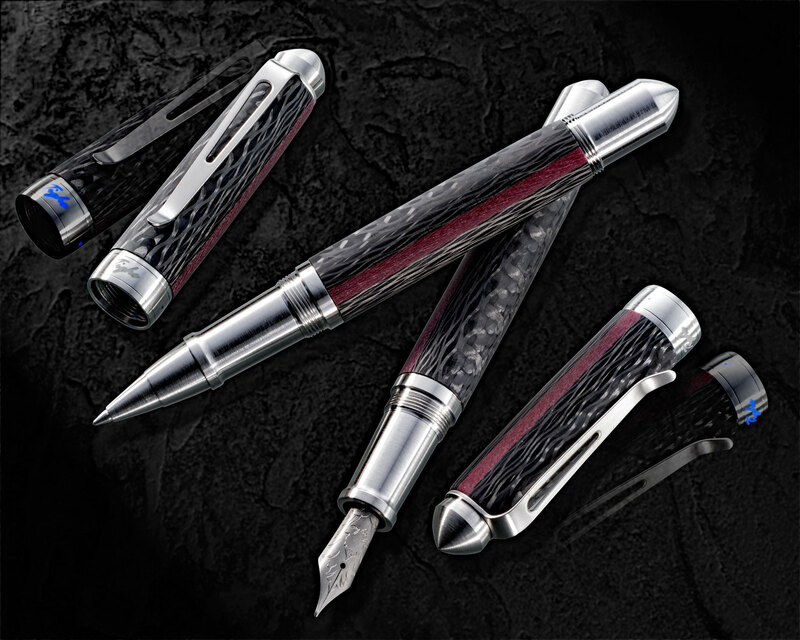 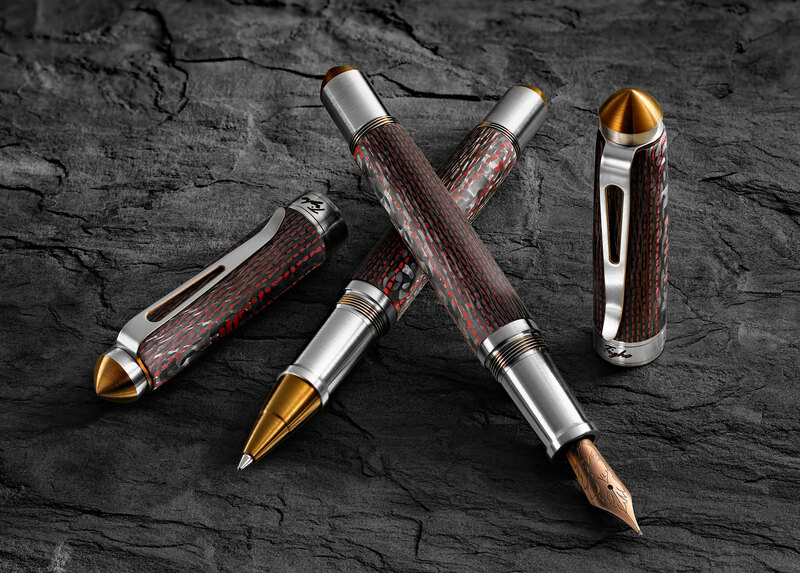 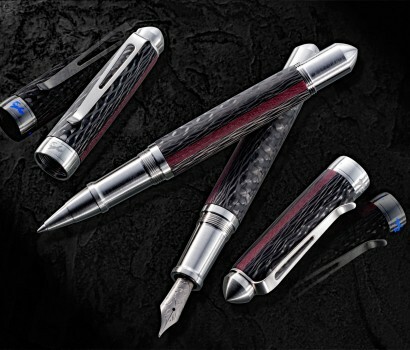 Handmade Hybrid Carbon Fiber and Red Glass Fiber composite over 2-toned Titanium. 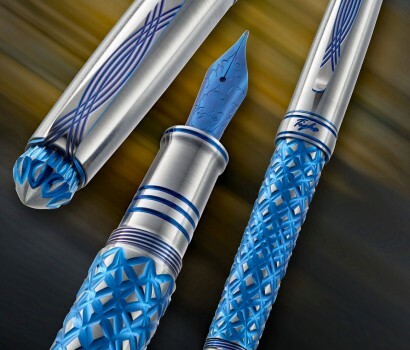 Fountain pen with coloured Titanium nib. 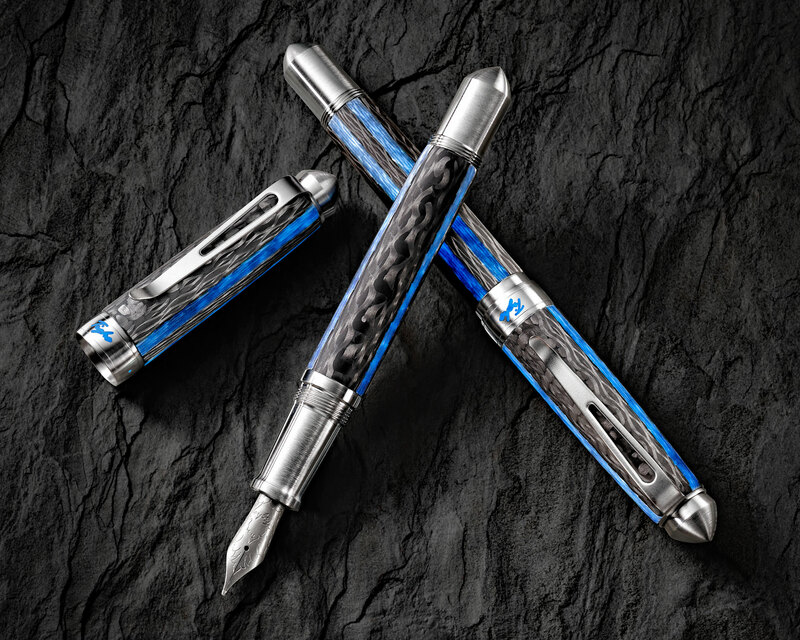 Handmade Hybrid Carbon Fiber and Blue Luminescent Glass Fiber composite over Stainless Steel and Titanium with luminescent cap band engraving. 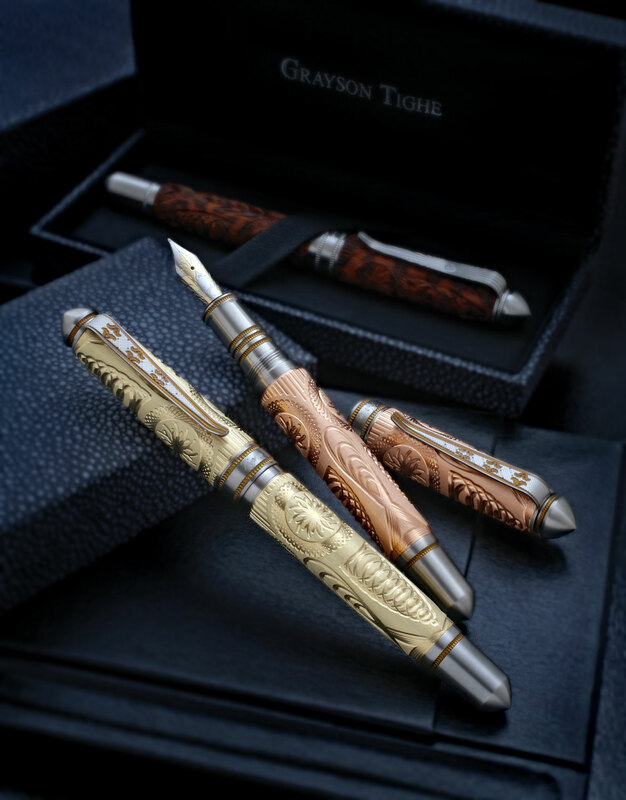 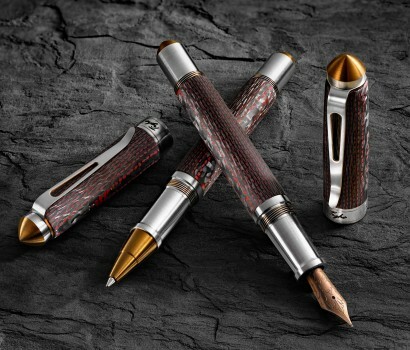 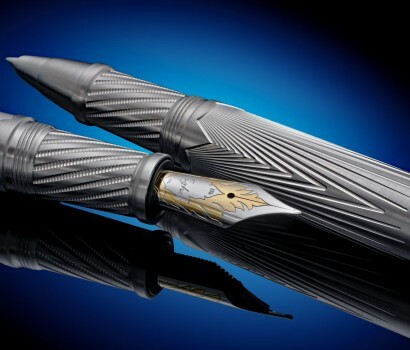 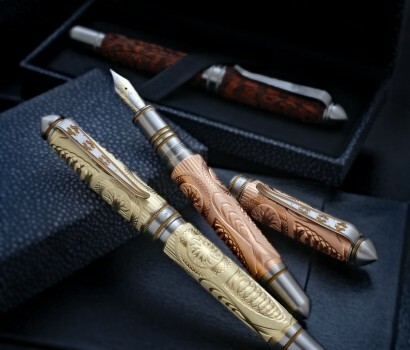 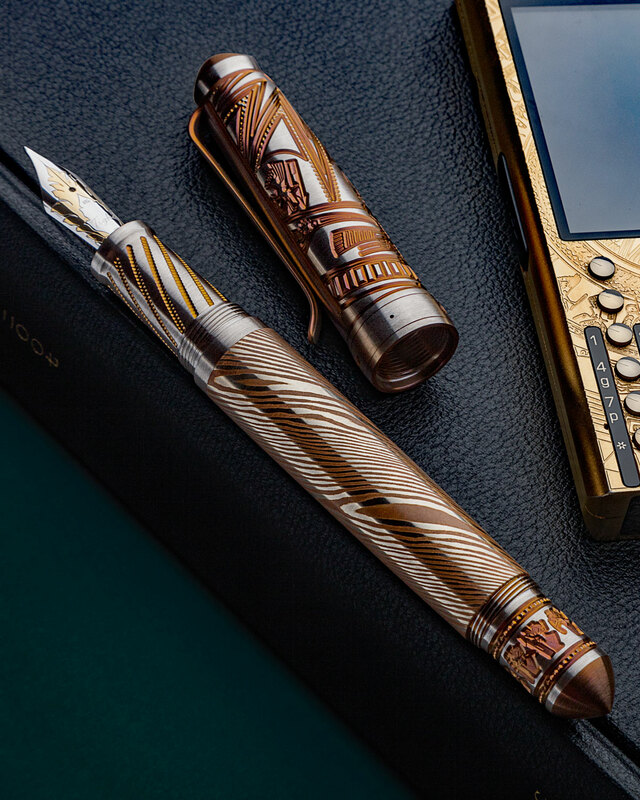 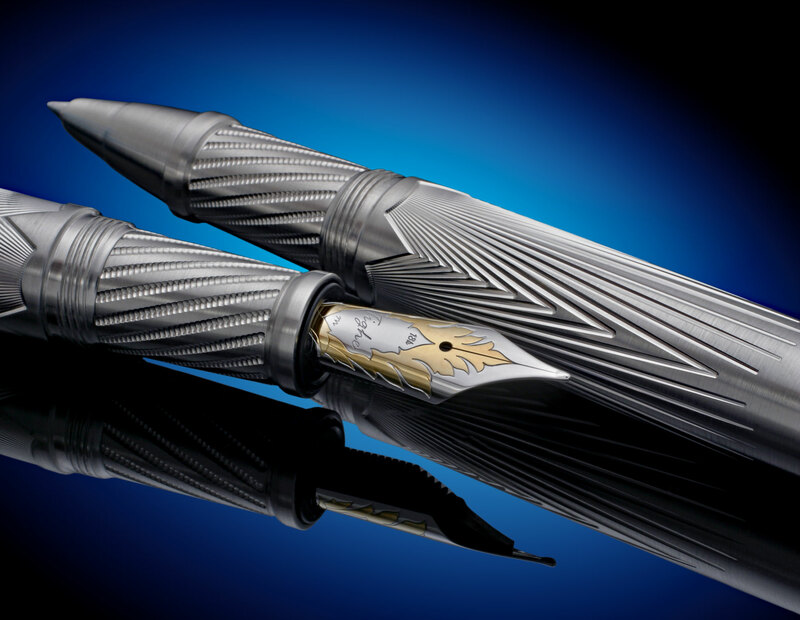 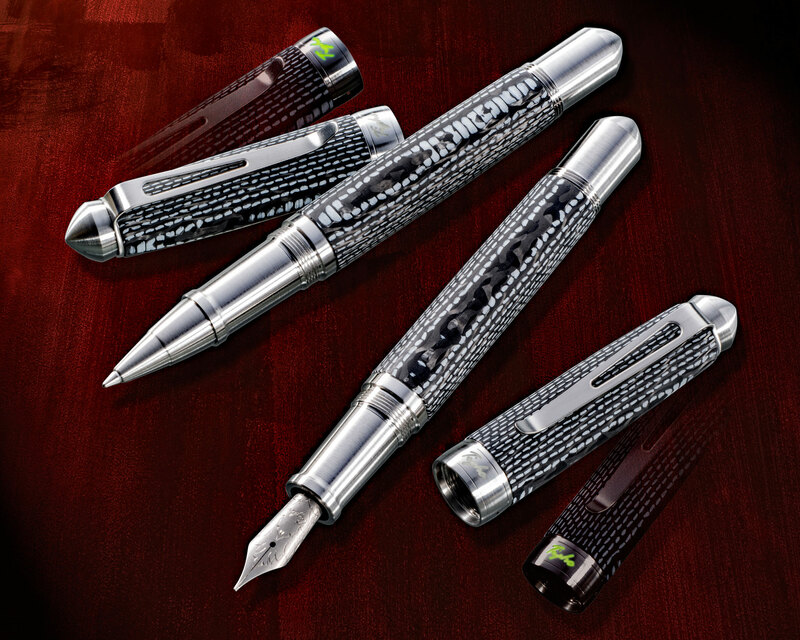 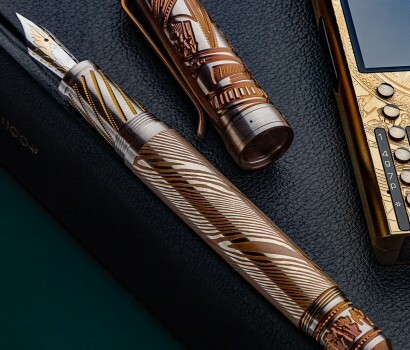 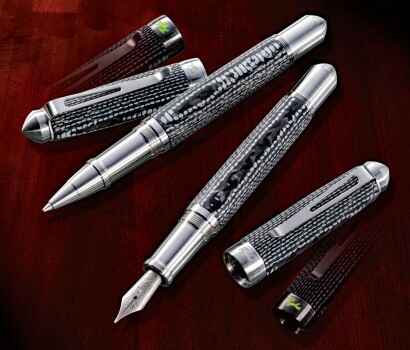 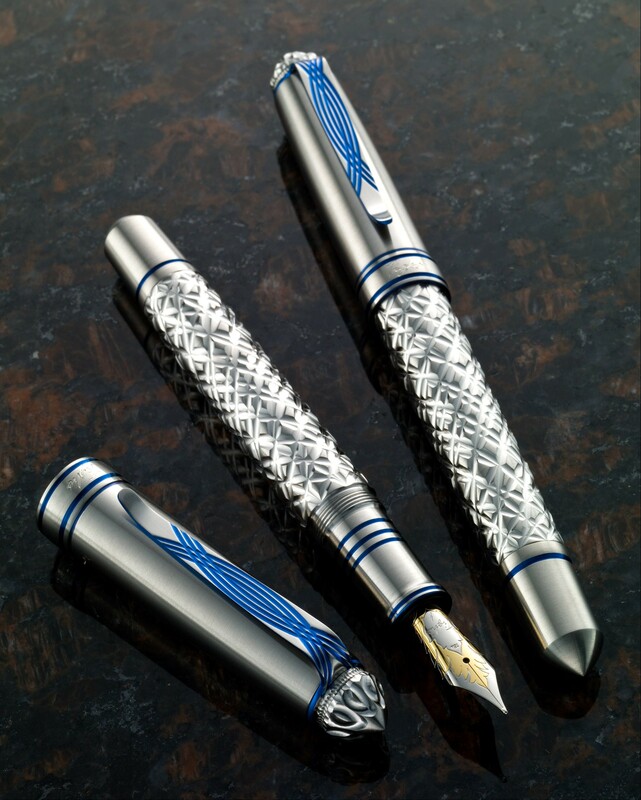 Fountain pen with Titanium nib. Handmade Hybrid Carbon Fiber and Aqua Luminescent Glass Fiber composite over Stainless Steel and Titanium with luminescent cap band engraving. 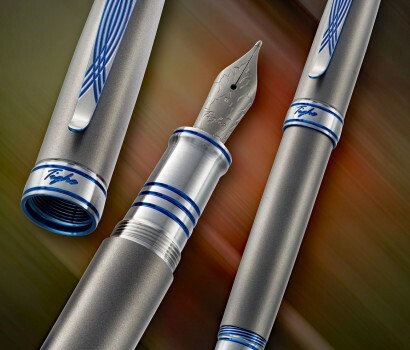 Fountain pen with Titanium nib. 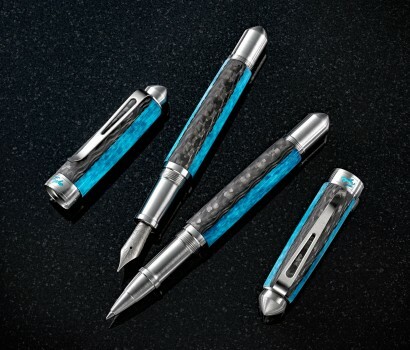 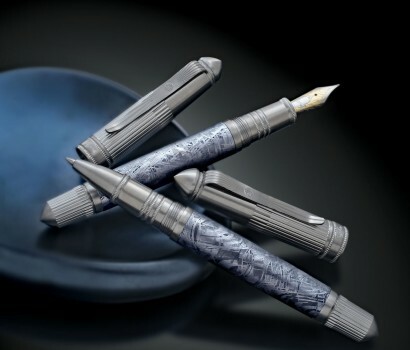 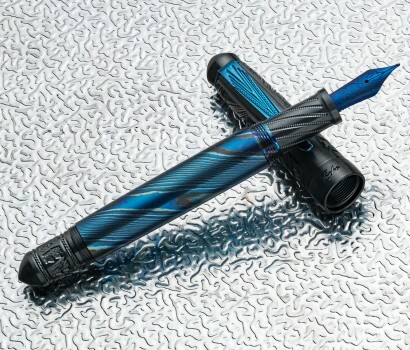 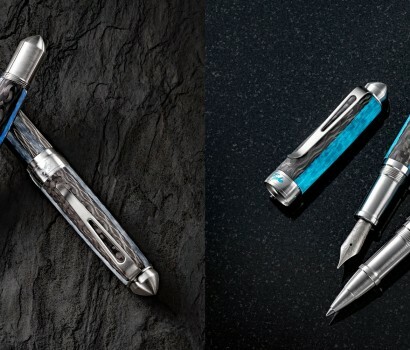 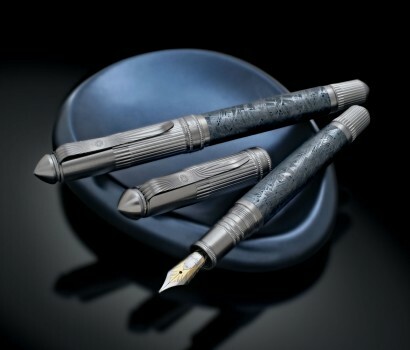 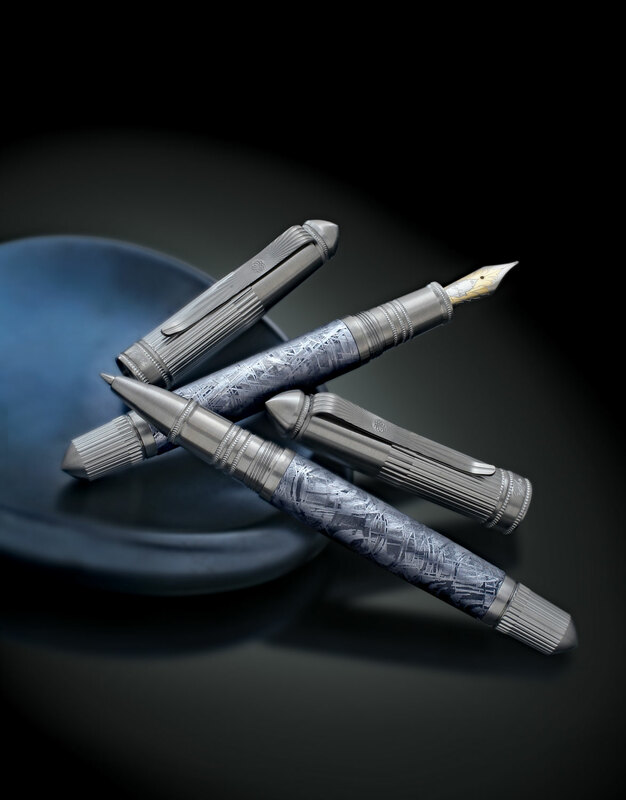 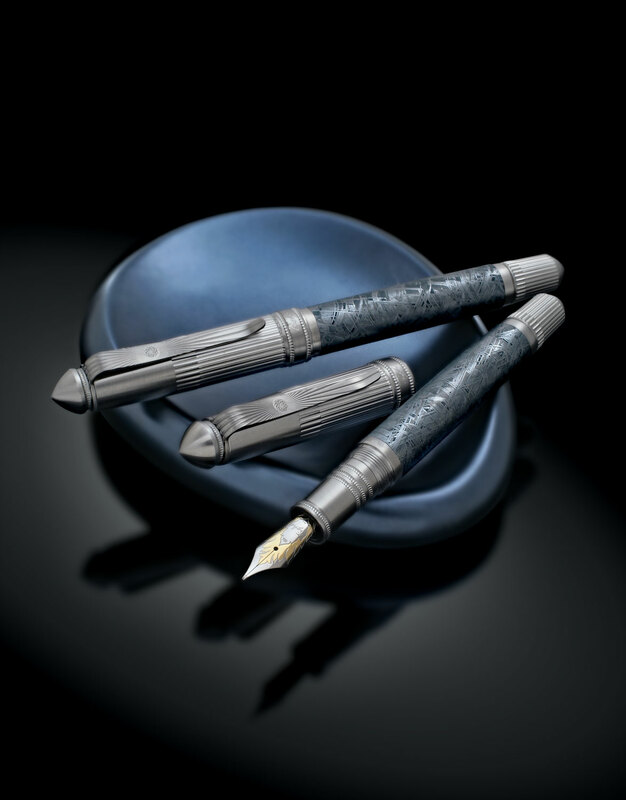 Blue Lume Fiber and Aqua Lume Fiber: Fountain pens are shown as they look in the dark after being charged with light and the Rollerball pens are shown as they look in the daylight. 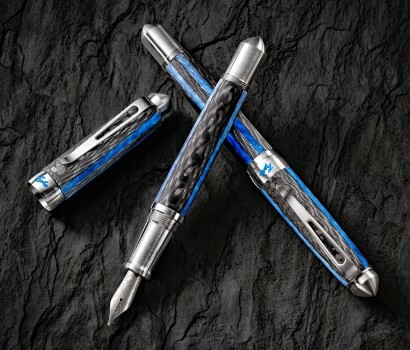 Handmade Hybrid Carbon Fiber and Glass Fiber composite over Stainless Steel and Titanium with luminescent cap band engraving. 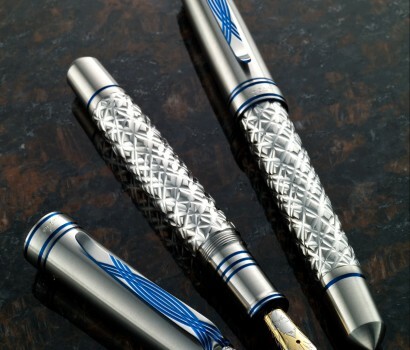 Fountain pen with Titanium nib.